Writing is not just for writers. Or to reverse that phrase: Everyone is a writer. I have been journaling for over twenty years, and I do not do it because I am a writer. Most of what I write in my journal is simply me putting down my thoughts, trying to focus for the day, or trying to make sense out of whatever is going on in my life. I usually write in the morning, and the writing helps clarify my mind for the day ahead. Sometimes it even includes a “to do” list, but more often I just talk to myself about what is important. I work as a substitute teacher, so I usually bring my journal to work with me and find a few minutes to write during the day. When I travel, I am more likely to write in the evening, because I want to record what I have seen and done during the day. Let’s say you have been thinking about starting a journal. The first thing you need is the right notebook. I would not advise doing it on the computer. You need a real notebook. It is portable, smaller than any device you might carry, and use don’t have to rely on a power source or airplane regulations. And there is something about putting pen to paper. The tactile sensation of writing somehow connects the experience to life in a way a computer keyboard cannot do. 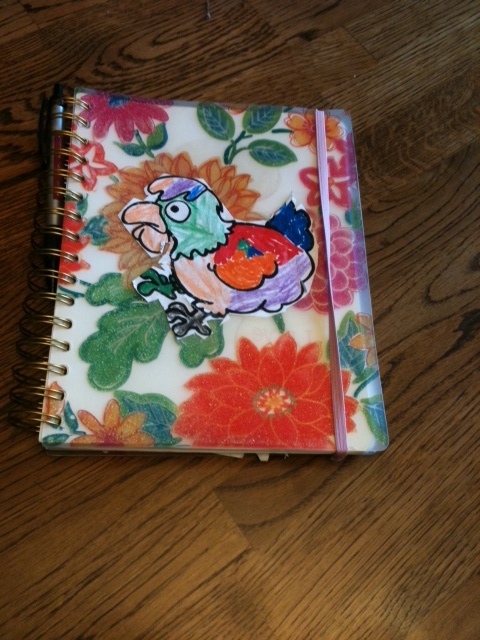 I like using a spiral notebook, and I usually pay the extra money and buy a nice one with a pretty cover. The spiral is important because it will lie flat as you write. Go buy a notebook, and next week I will write about starting your journal. Below is my current journal. I have been writing in it for about the last five and a half months.